The journey up spectacular Crooked Creek Canyon to the top of the Pryor Mountains was an eye-opener for my Texas friends, Teresa and Brian Strickland. For me, it is always an adventure and a journey into paradise. When we break out of the forest above the Big Ice Cave near the Devil’s Canyon overlook Brain asks, “What lives out here? “ Our eyes sweep over the beautiful but empty landscape of open meadows rimmed with dense Douglas-fir trees. “Oh, there are deer in the forest in places, bears sometimes, and small mammals and birds,” I answer. “I don’t see anything,” Brian responds. 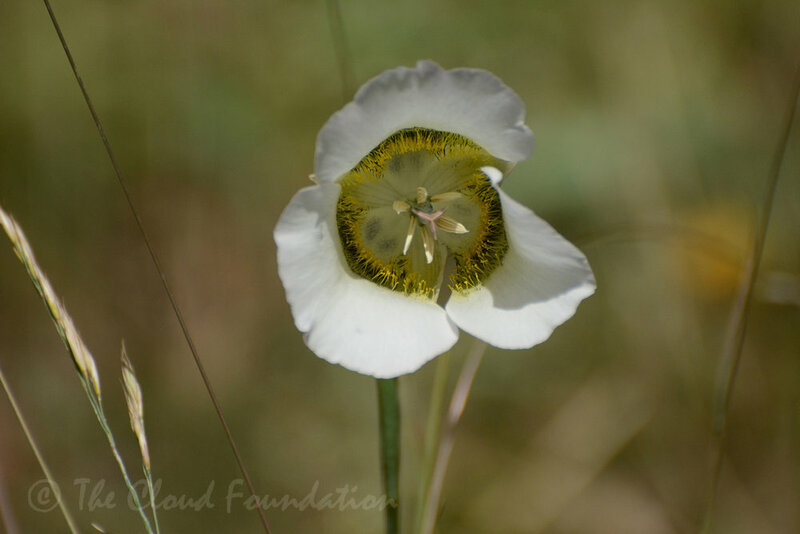 His honest first appraisal of the spectacular Custer National Forest Lands just a few miles to the east of the Pryor Wild Horse Range takes me aback. “Well, there used to be more to see," I respond, swept up in a flood of memories. “People used to park their vehicles along this road and sit on the rock outcroppings, watching bands of horses running across the meadows.” “Why aren’t they here now?” Teresa asks. “That, my friends, is a very long story,” I answer. Just then we round a bend and the enormous, two mile-long fence looms ahead —built in 2010 on the boundary line between BLM and Forest Service lands. The Stricklands are stunned and saddened, but we don’t let this ruin their one-day journey to find wild horses atop the mountain. A storm has pushed the horses into the forest and we enjoy watching a few bands nestled in the trees amongst the late summer flowers. 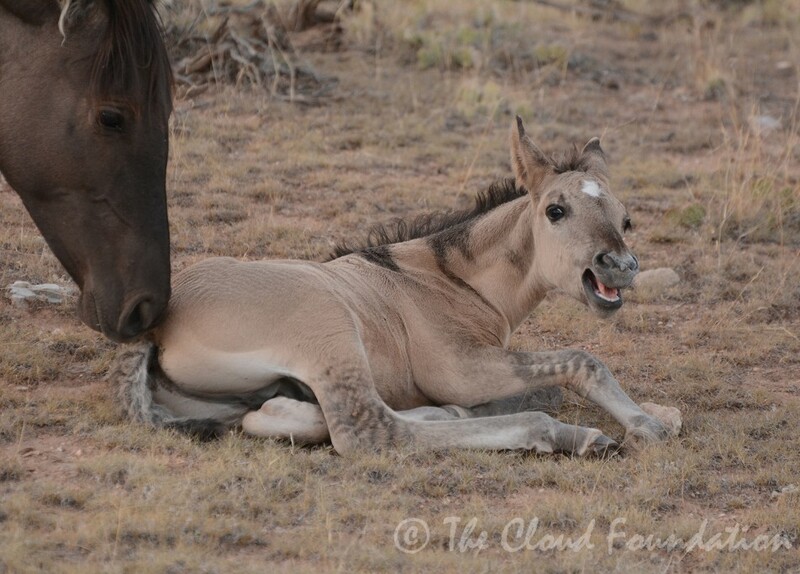 They meet Pride, Cloud’s outgoing son born into Mescalero’s Band in May. The unusual pale buckskin colt is busy getting every mare up so he can groom with them. What a character! I think, remembering his father at this age. Cloud was so busy at this age, forever pestering his sisters, Smokey and Mahogany. The fun-loving bachelors move through the trees and give us a smile, and happy memories. Three year-olds Mato Ska and Missoula are sparring as they have their whole lives. These two are among the lucky ones. Because both have unique coloration, they are not to be removed in the bait trapping that begins just a few weeks after I leave the mountain. Brian, Teresa, and I hike into the forests beyond the Spring-Fed Waterhole looking for Cloud with no luck. 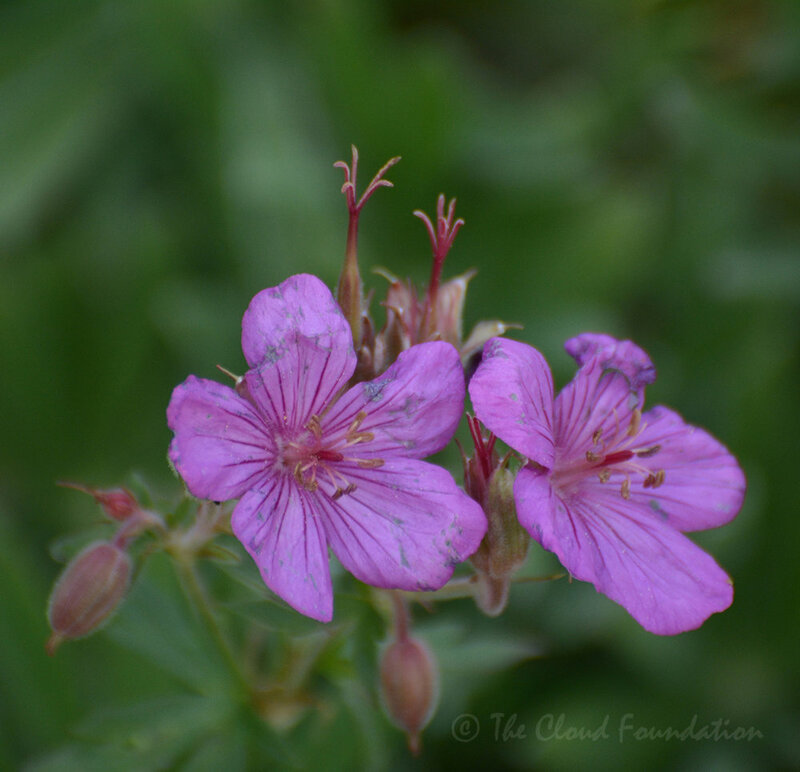 Bright magenta geraniums bloom in profusion at the forest edges. Cryptic blue grouse crouch in the tall grasses. We flush one male into the trees. Can you see him and his bright orange comb over the eye? What incredible camouflage. I take my friends down the mountain in the evening and turn around the next day to drive to the mountaintop, this time with camping buddies Linda Hanick, Penny Longnecker, and of course, my loyal Quinn. Eventually we’re joined by our Montana friend, Kristen Collett. The summer storm which caused the horses to be elusive when the Strickland’s visited is only a memory now. Many wild horse bands are in plain sight, moving back into the area out by the big fence. 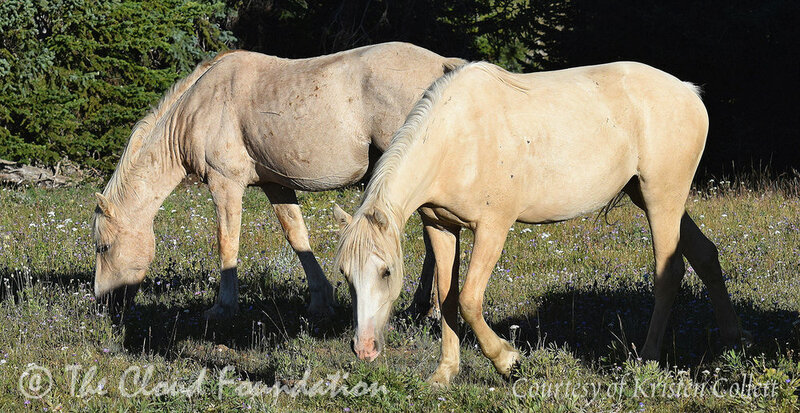 The Custer National Forest does not acknowledge the rights of the horses to the forest service lands they manage in these highest elevations so they commissioned the building of the fence. In this picture you can see the flags across this field where the fence was built in late summer of 2010. Only a few hundred yards from the fence, a bait trap has been set up to habituate the horses to what appears to be a benign and even positive new development in their world. Occasionally BLM spreads horse candy through the open pens and alleyways. Soon a select, few young horses will lose their freedom. While this is a benign way to catch a few 1 to 3 year-olds, the result is the same. I know as I watch them, some will lose all they hold dear. Why does the BLM need to remove horses? It is a question I am asked nearly every day. The answer can be summed up in two words—the fence. Less acreage available for grazing equals fewer horses that can exist without damaging their fragile sub-alpine and high desert homeland. 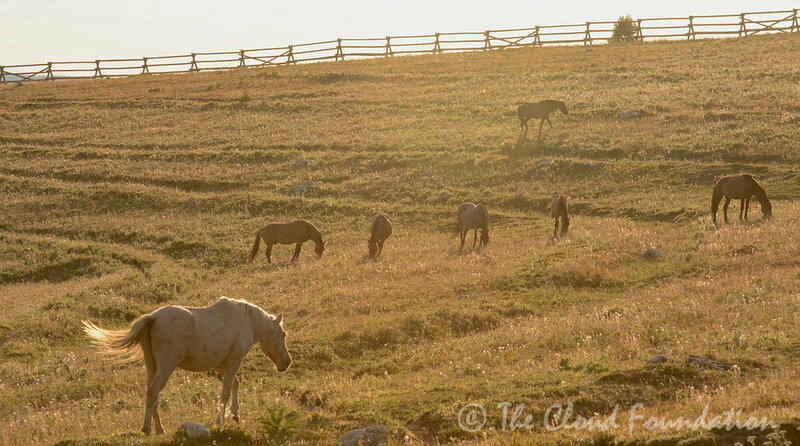 Most of the Pryor mustangs remember a time when a giant fence did not prevent their passage into the wide, productive meadows in the Custer National Forest Service lands in late summer. All those born before 2011 remember the drill. Come in to drink at the spring fed water hole and then trail on out into the Forest Service lands. We watch the horses on one of our first evenings. Band after band comes to drink, and then they walk out along this daunting barrier. Mescalero’s band is here with Pride and Missoula. The three-year old sorrel pounds on the thick, immovable wooden rails. Pride sticks his head through the rails, nibbling on the tall grasses and staring out at the untouched plants beyond. The fence robs the herd of critically important late season grazing lands that transformed robust horses into rotund ones. And restricting the herd from grazing in the area across the fence diminishes the quality of the forage in the Forest Service lands. Because the plants evolved with big grazers moderate grazing is key to their health, just as the plants are key to the survival of the horses. Cloud too is drifting toward the fence and I wonder if he is still hopeful that there will be an opening to slip through. I watch him walk by me at sunset. He looks fantastic. Everyone who sees him remarks on his recovery and how much weight he has put on and the twinkle that has returned in his dark, expressive eyes. But, he is no longer young and he has spent 15 of his 20 years fighting to hold a family together. If the horses, particularly the very young and the old, are to live through the long winter to come, in which they lose weight each and every day, they must be at their maximum weight in the fall. If horses go into winter on the lean side, it is unlikely they will live to see another Pryor summer. I know that the fence could prove to be Cloud’s ultimate undoing. We are still filming as the sun sets and the full moon rises. It is the second full moon of the month---a relatively rare phenomenon known as a blue moon. The moon lights the way as we finally return to camp. Dawn breaks with a happy visitor to our little campsite. It’s Cloud, we whisper excitedly, backing off to our vehicles, giggling like little children as the handsome stallion sniffs around our table and chairs, coolers and water containers. He seems particularly interested in the box for Linda’s coffee press, but he soon loses interest and wanders away. A few minutes later his two-year-old, look-alike daughter, Encore, steps from the trees hesitantly, giving our area a brief look. Then the filly rejoins her stallion, Knight who is with Cloud, Mato Ska and Maelstrom. Wow, I think. A family reunion. I film and Kristin takes stills, as Encore says a sweet hello to her father. It is wonderful to see how engaged he is with his lovely legacy. That afternoon, Kristen comes to find me. She is laughing and carrying on like a little kid as she tells me about Cloud. He discovered an unopened bag of horse candy near the BLM trailer and the bait trap. She said a few horses had come, sniffed the bag and moved on. That’s when Cloud arrived, walked over to the bag and picked it up, spooking Galaxy and his band who raced away. Then Cloud shook the bag so hard it burst apart and he proceeded to eat the contents. On one of our days, Linda, Penny, Quinn and I travel down Sykes searching for Cloud’s youngest daughter, Orielle and her mother Innocentes. We’ve not seen them since spring after they were stolen by Inniq, an inexperienced desert stallion. 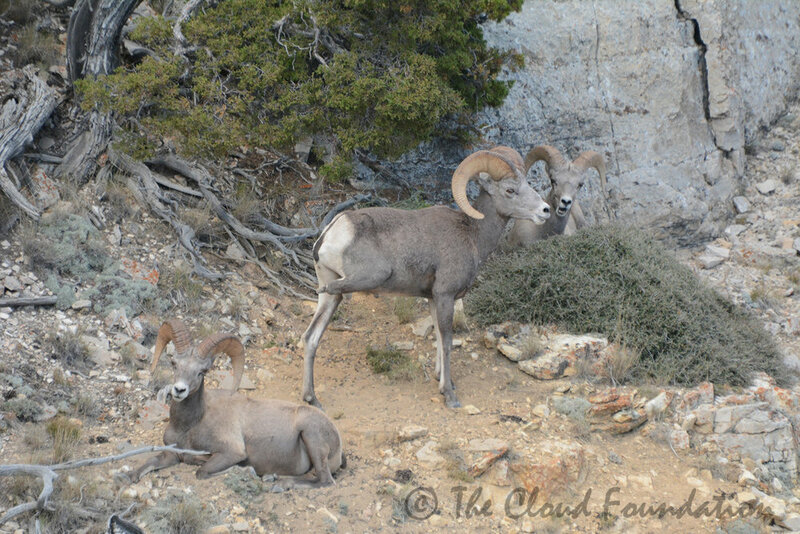 Our journey takes us into the most remote parts of the Pryor Mountains and, although we don’t find Innocentes and Orielle, we’re thrilled to be able to film a herd of Bighorn Sheep rams. We follow the rams at a distance as they cross the road, heading toward to the very edge of a steep drop off. Thousands of feet below them are the Park Service lands and the enormous Bighorn River Canyon. I feel my knees grow week as I focus in on the younger rams leaping onto a slender butte that juts out over the cliff edge. Meanwhile, the others defy gravity, walking atop a rampart that appears to be only two feet wide. Any fall would result in death and all I want to do is sit down and bring myself down to solid ground, but I keep on filming these daredevils. Before we overstay our welcome, and before I lose my breakfast, we leave them. We continue down Sykes for a short way looking for horses, determined not to be skunked. Where are you Innocentes and Orielle? And are you alright? While hiking at the water catchment above Dead Biologist’s curve, a beautiful stallion comes into view. 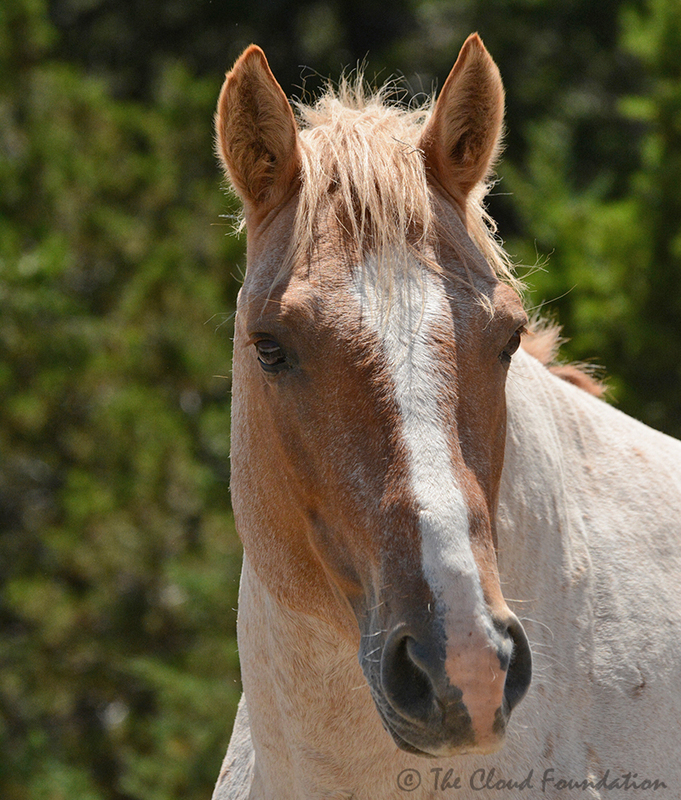 It’s Jemez, the mature Apricot Dun bachelor stallion. He looks lonely down here, but then maybe he isn’t alone. It is a vast landscape around us with a million hiking places. We head back up to the mountaintop. 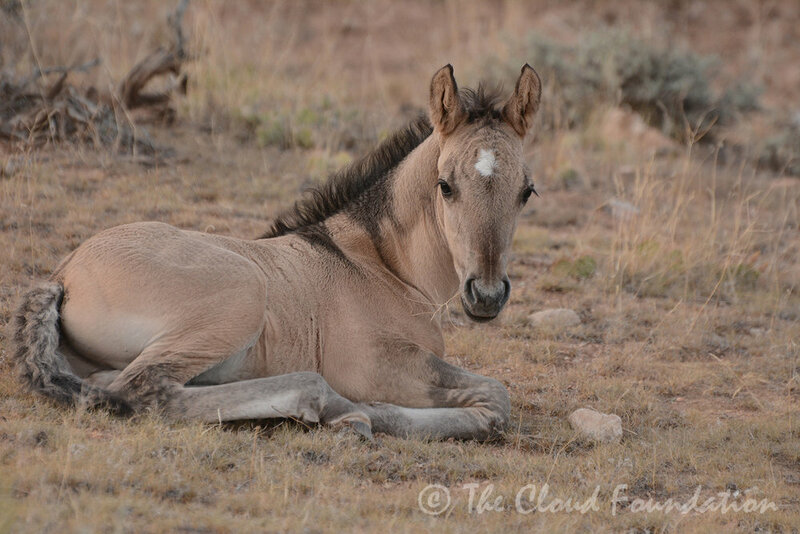 We all enjoy watching and photographing the late born foals, even though we know there are too many being born to achieve what so many of us are working toward---zero population growth. If average yearly mortality of 8-10 horses is matched by 8-10 surviving foals there will be no need for future removals. Perhaps the most remarkable foal waited to be born late in the summer. He is the firstborn of the two year-old dun filly, La Nina. Our friend, Nancy Cerrroni, who discovered this remarkable colt just before we arrived, named him Pax. With my friend, Ayn Nguyen, we spot Pax and his family at sunset in the Dryhead. Like most of the wildlife in the Pryors, from the Bighorn Sheep and Mule Deer to the Blue Grouse and the Cottontail hiding just a few yards from the colt, Pax too is cryptic. Look at you little fellow. Talk about stripes! As the sun drops behind Sykes ridge, we sit with the band and pray this little one might live his life in freedom. Back home in Colorado, I am in agony reading about the bait trapping and removals. Honestly, I am relieved not be there, as there is nothing as hard as seeing these precious, bright-eyed young animals lose all they hold dear. We work toward a day when every foal born wild in the Pryors can live in precious freedom. They will travel to the spring-fed water hole with their families and trail out into the Forest Service land that has been their homeland for centuries. No fences, no barriers. They will gorge on late grasses and go into winter as fat as butterballs and come out in the spring strong and ready to make that summer climb to their sacred high mountain meadows. We ask for your help in making this dream an enduring reality! 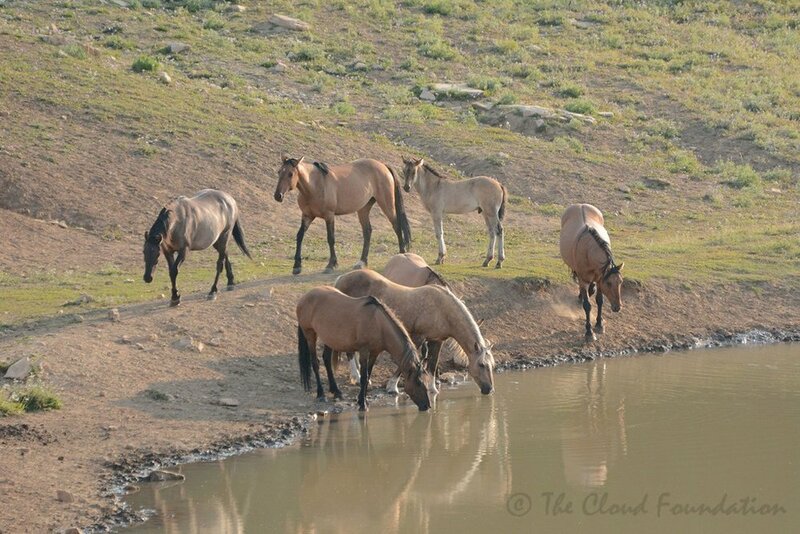 Thanks to all of you, who adopted one of the precious 17 (plus one foal) Pryor mustangs this month. We hope you will stay/get in touch and let us know how your horse is doing. Please do not hesitate to call if you need help, or if you want to share a story or a picture or two.